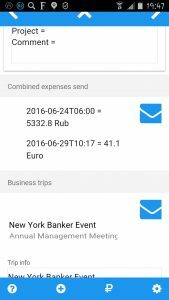 Avansovka is the expense reporting Application for Russia. Avansovka has been developed by Accounting and IT specialists to simplify expense reporting in Russia. 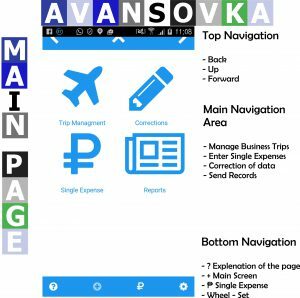 You are now working with the first version of Avansovka, the Application. More functionality will be added to the app and the app will be expanded by a server version / web service offering even more functionality. Please contact us if there are any questions or input. Your Avansovka Team. Contact data click here. Avansovka is an application-only solution right now. All the data is processed and stored locally on your mobile device. You have full control over your data. 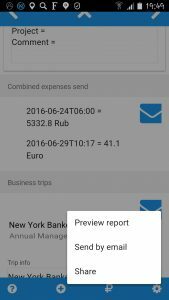 At the current stage of development Avansovka is a tool to simplify the collection and documentation of expenses and the sharing of documentation with the responsible persons generating the expense reports. Avansovka, for full functionality, requires you to have an active email account on your smartphone. Avansovka works on Android devices with the operating system version 4.4 or higher. Avansovka works on Apple IOS devices. In theory, Avansovka also works on Microsoft-based mobile devices. When you download Avansovka you receive an Application with the possibility to add sample data and with preset settings. To simplify operations further, all that needs to be done upon startup, if you like the standard settings, is to enter the email account of the recipient of the expense reports. Avansovka operates in three languages right now: Russian, English and German. If your smartphone uses one of these languages, Avansovka automatically uses your prefered language. If you use a different language, Avansovka selects English as your startup version. To simplify the startup, there are certain settings done in Avansovka upon startup. They are listed below in the section – startup settings -. Feel free to make changes to suit your needs. Avansovka – flexibility by design. The top navigation allows you mainly to jump back, up and forward. Back and up are often the same; forward does not have functionality in all sheets. The main page is the central gateway to work with any of the expense reporting functions. By pressing the + button in the bottom navigation, you can get to this page from anywhere. 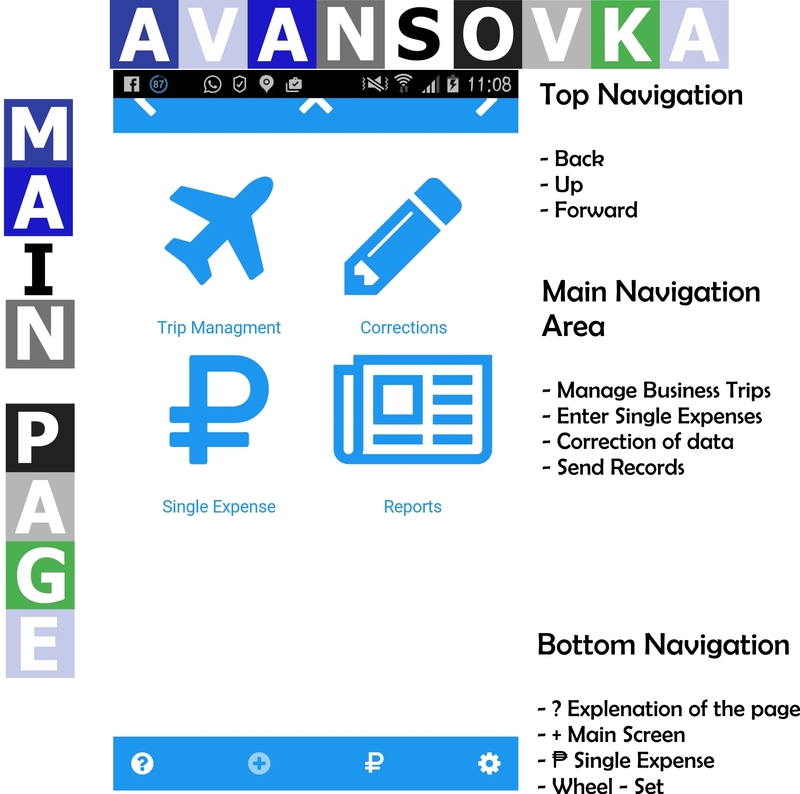 Manage Avansovka from a single page. 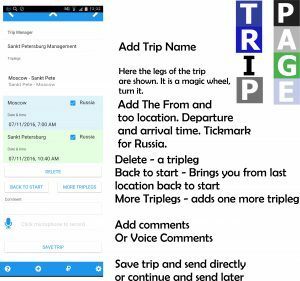 Trip Management: Here you set up a trip so that you can sort all your expenses against the trip and have them all magically sorted the Avansovka way. Single Expense: Here you add single expenses to the system. Take a picture of a receipt and add the data to the system. Corrections: Well, sometimes it happens: something that you entered in the system is wrong. This is the place for all changes. Reports: When you are finally ready to send your expenses, this is where you do it. 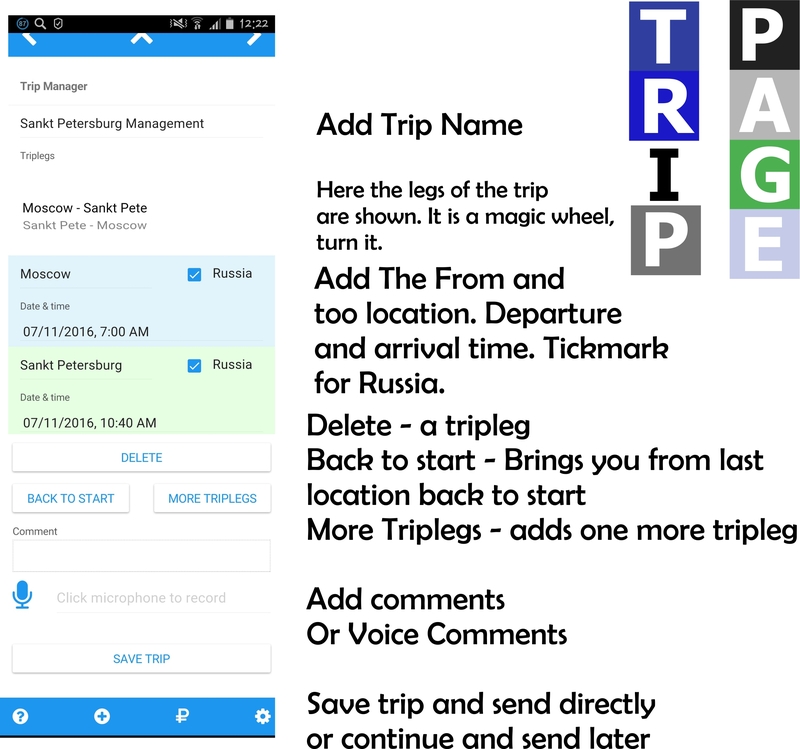 Trip management is one of the unique functions of Avansovka. You as a user decide whether you want to use it. Each individual expense can be attached to a business trip. Or not. Flexibility by design – Avansovka. The business trip function is very flexible. The principle is that you program your business trips by business trip legs into the App. A business trip leg is a part of a business trip. This may be a flight from Moscow to Stockholm or a stay in Berlin for several days. Each business trip leg includes a “departure” and “arrival” date as well as the time you stay in a certain location. 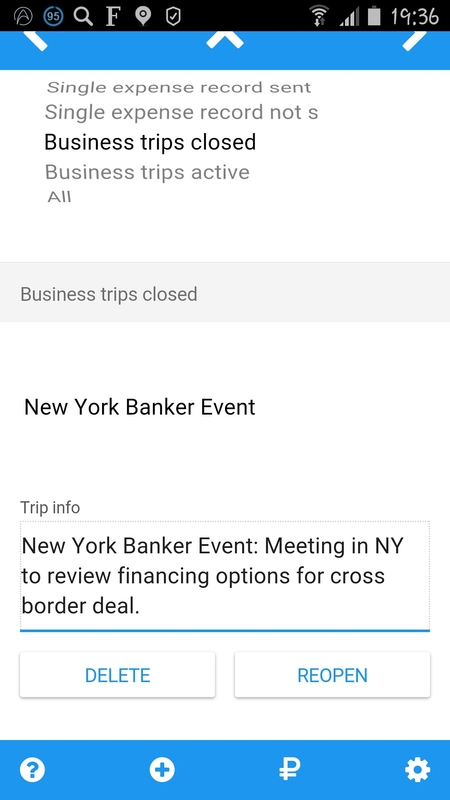 If you’ve entered the expenses with the correct time information, they will be sorted by business trip leg. Perfect order of all expenses. Related to one business trip. You can have several business trips programmed. Flexibility by design. The Avansovka way. All business trip expenses that are allocated to a business trip but not clearly allocated to one of the timeslots are listed at the end of the business trip expense report. Later on, in the server version, per diems will be calculated here as well. An expense to be allocated to one trip must fall into the time window between the start and end of a business trip leg. To calculate correctly and automatically, departure and arrival times are important. If a user stays at the business trip location for a certain time, this should also should be programmed as a trip leg. To add an expense to a business trip, use the single expense sheet. 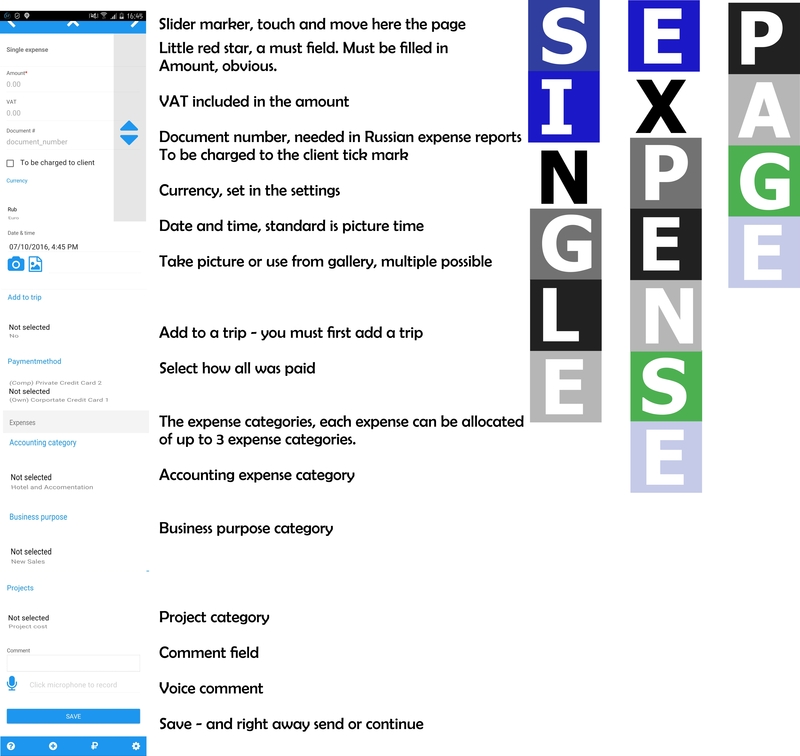 The single expense page is long and complex. The good news: you decide what you want to use. You can use all inputs or just the basics – one or two inputs. And you can decide much more than that. And you have a special setting – the must setting – forcing you to input something if you need the system to remind you about the data needed. It is called a “must input” – you must enter it, and if you don’t, the system won’t save your data. Fields that are not “must fields” you can choose to fill in or not. 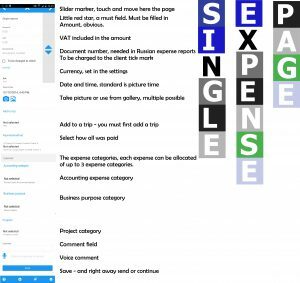 The single expense page is the best example of Avansovka’s theme – Flexibility by Design. You, the user, decide what to do. Easy, complex, rules, flexibility. You decide. Flexibility by Design – Avansovka. And read more about this unique page here. Correction sheet is a very advanced function in Avansovka which needs some explanation. You should use the correction sheet if there is a mistake in data you entered into the Avansovka system and you want to correct it. As the system when you use it might have a lot of data, there is an option of filtering the data before you correct it. It is a three-step process. And some might argue that this is complicated. 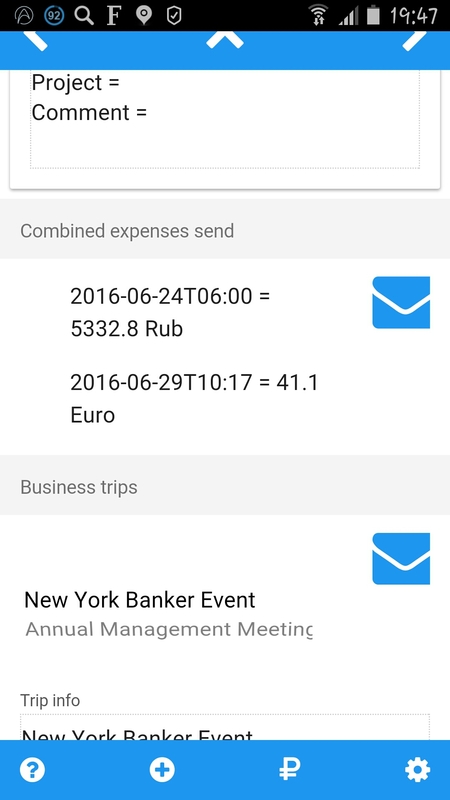 Actually, it is unique that you can easily select and edit single expenses on a mobile, when you might have over 100 expenses in different categories. How does it work? First select what you want to correct. There are four choices. Here you can filter all data by type first. Or select all. You have the opportunity not only to correct what is not sent to the accountant or assistant, but also to “reopen” what already has been sent. If there is no data for the category you select, the system will tell you so. Additionally, you can sort by generation date of the files and so further limit what you see. If you enter no timeframe, all data is shown. Then you see a magic wheel with all the items that fall into the selected category and you can select one and manage it. The options are listed below. Like edit and delete here. Select in the magic wheel what you want: expenses sent or not sent. If you want to limit the timeframe, then add the timeframe to the dateline. If you leave a date open in the timeframes, it means it takes all. E.g. if you mark 1 August 2016 in the timeframe “Single Expense Record sent” in the “sent from” cell but leave “sent to” open – then it means it takes all records sent from 1 August 2016 until today. Once you have done this you, see a magic wheel below which lists all expenses that fall in the selected range. Turning the magic wheel, you now see below in a box the details of the expense and the options below. If it was sent already you can edit it. If you choose to edit an expense file sent earlier, the single expense file gets marked as “not send” and you can send it again. The expense file will then be marked with a comment that it is a correction. Avansovka has a unique business trip function. The business trip function helps to structure the expenses incurred and allows a trip to be more easily documented. There are active business trips and closed business trips. An active business trip is one which can be seen on the single expense sheet and to which single expenses can be added. A closed business trip is one to which no expenses can be added. 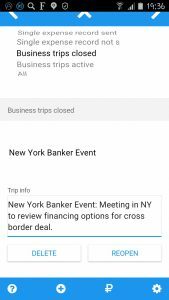 A business trip is automatically marked as closed if the business trip information is sent. A closed business trip can be reopened. Or you can delete it. All single expense data stays in the system; just the business trip is deleted. 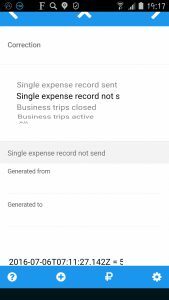 Reopening a business trip means you can again attach expenses for this business trip in the single expense input sheet and report the business trip by email or other means to the person processing the business trip expense. In the reports sheet you only see “not sent” expenses. If an expense has been sent it cannot be seen here. If you want to resend it because of any issues, you can call up the expense in the correction sheet and edit it. 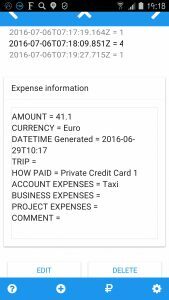 You can also reduce the number of expense records you see by selecting the timeframe when the expenses were generated. Then e.g. 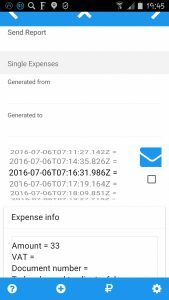 if you want to work only with the expenses for August, just put the timeframe in the “generated from” (1. August 2016) and “generated to” (31. August 2016) cells. You have three flexible ways to send something. 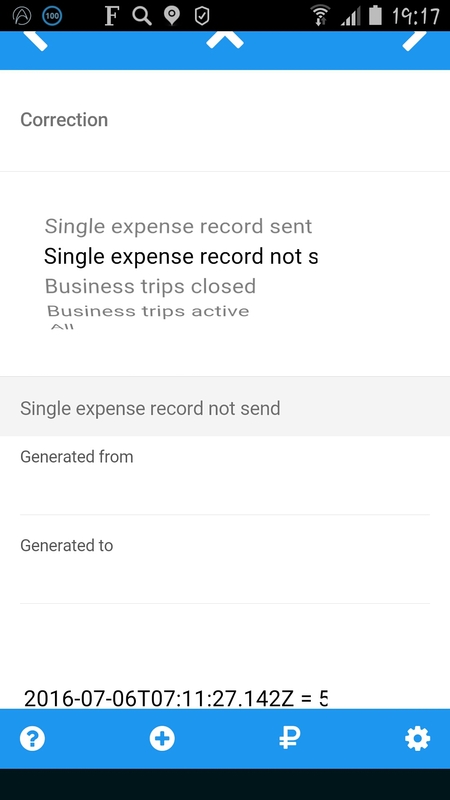 First, you can send just single files as in the single expense sheet. Just select the record on the wheel, and press the email button. You can then preview, send by email or share. Preview allows you to see what is in the system. Then you have the choice of jumping back or pressing the arrow button to send. Share is a very unique function. Share will open on your mobile all apps which accept the share function. Unfortunately, in this version of Avansovka, what you share cannot be controlled, as often only the text is shared (e.g. by Whatsapp) but not the picture. Future versions of Avansovka will be more advanced in this regard. Now, as it is highly inefficient to send lots of single emails, you can also combine several expenses into one big file. This is done by clicking the little tickmark below the email button. If clicked, the expense item is added to the combined list. You see the combined expense list below. When you send a business trip this way, the business trip is closed and all attached expenses are marked as sent. Here you can fill in your personal information. In later versions the personal information will be used in the expense reports generated. Currently this input page is not actively used. Here you can select the language you want to run the Application. You can change as often as you like. Please be aware that in the current version of Avansovka, if you add new text to any of the magic wheels, the text will be copied to all magic wheels in all languages. This will be improved at a later stage. And if you would like to see a new language, please tell us. We plan to expand the language settings substantially. And last but not least, please be aware that, if you set the system to one language, emails will be sent in this language as well. In later, more advanced versions, we will have a function for sending copies of emails in a different language from the language of the user. Another first in an expense reporting system. Follow Avanasovka and be amazed by its design and flexibility. The current version allows only Russian ruble per diems. Standard or personalized settings. Per diems are not yet calculated in the expense report, but will be in the very near future in the server version. The future version will be more flexible and allow different formats or per diem calculations as they’re done in the CIS. We are really proud of our innovation – the magic wheel. What is magic about them? Well, just about everything. So lets start by explaining how they work. The wheel is really user-friendly, because you can easily turn them and select what you want. There is still one limitation which will be addressed. 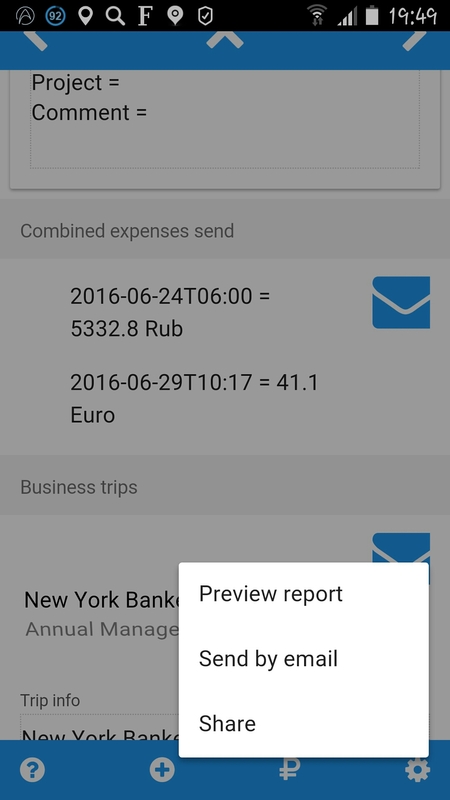 If you add a new expense line in one language, it shows up in all other languages as well. And you cannot change the text if there are spelling mistakes. This will also be addressed. One of the real inovations of Avansovka. Each expense can be allocated by the user to up to three expense categories. And the content of the expense categories is totally flexible. Flexibilty by design. You decide and set what you want to use. You might wonder what all these categories are needed for. Well, in the future, with the upcoming server version, the system will generate sums in all these categories, and then with the advanced version you will have budget functions and be able to control expenses directly on the mobile. And if you do not want to do all this, switch all these functions off as explained below. Here you enter the accounting expense categories that your accountants tell you to. Each company has slightly different categories. Standard settings are entered here. In the coming updated server version, this can be aligned with your company’s accounting expense categories and your accounting team. A small upload will add one more function in the next Avansovka version, and all will flow automatically into your accounting systems. Business categories are set up as for a consulting company. You can change them to model your business processes. Decide how your business processes work and how you want to split the expenses. And decide what you want to monitor as business expense items. Obvious. You define your projects and then count the expenses per project. Easy. Now imagine the combinations possible. A two-dimensional matrix to control budgets by Projects and Business expense type. Flexibility by Design, you build your own system to control expenses as you see fit. Another great innovation. It is key for your accountant to know how expenses were paid and for you to get the money back for all expenses which you paid out of your own pocket. Standards are preset, and you can adjust them easily by switching off some lines (untick) and deleting (left slide and delete button) or adding others. If you add e.g. Mastercard Platinum 1467 and the off switch, it means your private Mastercard Platinum with the number 1467. Flexibility by design, tailor it to your individual needs. Here you add the emails of the people who should receive emails with the expenses. Set e.g. here your Accountant and Assistant. You decide. And in your email box you thus document all expenses sent. And soon, you’ll be amazed, the server version and webinterface will further simplify the process. One of these fields will be very useful in the future. When the advanced version with automatic reporting is in place, this data will be used to fill in AO-1 forms and other automatically generated forms. Wow! There is no single page that better expresses Avansovka’s theme – flexibility by design -. You select by the right button if you want to see this line as an input on the single expense sheet. Off – and it is not on the sheet. And if you want to mark things on the expense sheet as must fill in, just set the tickmark “must.” As a user, if you do not enter data and press “save,” the system will remind you that you missed something. 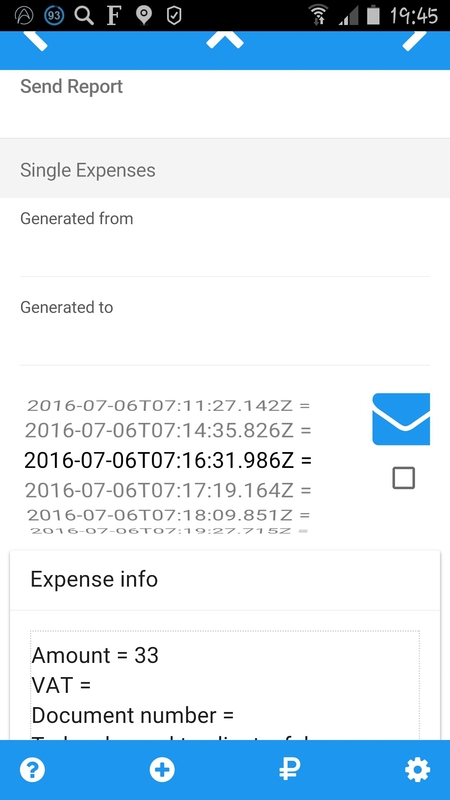 If you want to see how the system works without generating your own expenses, you can upload sample data. Just press “install sample data.” Then go to the reporting and corrections pages and see the data there. And just press “delete sample data” if you want to clean it out of the system. This is an easy way of seeing how the system works. 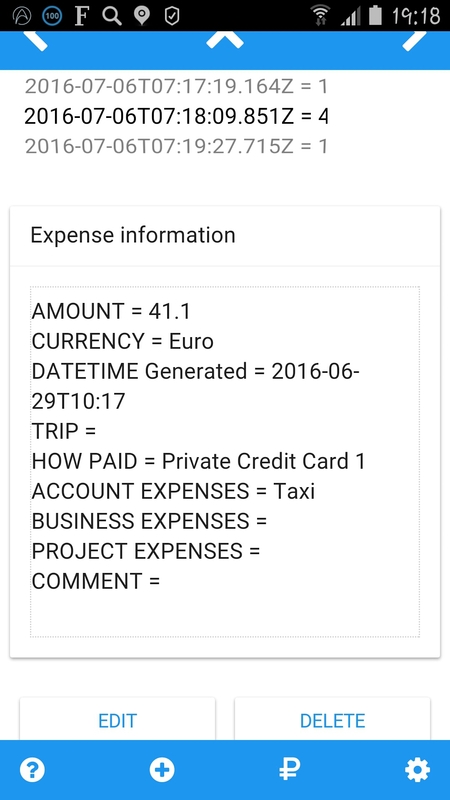 The sample data here is from a business trip and shows the trip function, how to set it up and how to file expenses against the trip. Easy. 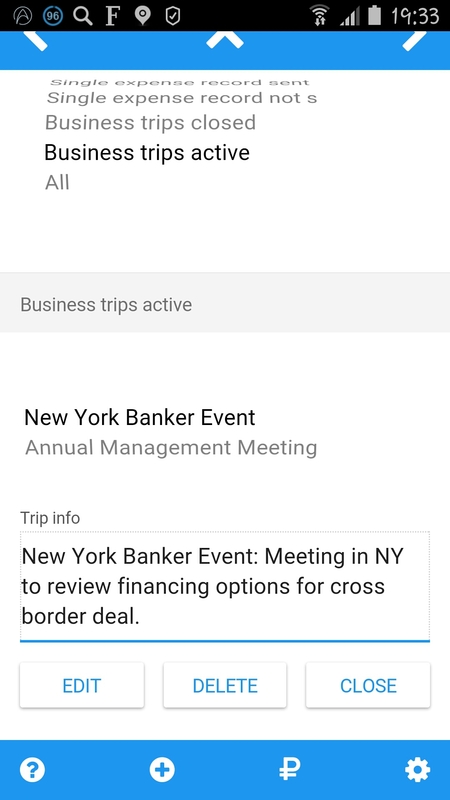 Automatic popups to collect more relevant accounting information like the purpose of business trips, who was present at restaurant dinners, etc. And much more to come. Be amazed – Avansovka -.